Specially engineered for laser peripherals. HP Laser Glossy Brochure Paper, 97 Bright, 52lb, 8 1/2 x 11, White, 100/Pack - Two-sided coated finish produces eye-catching images and photo quality results. Heavyweight with a glossy coating to deliver exceptional image and quality on both sides. Ideal for image intensive laser printing, including photos, flyers and marketing materials. 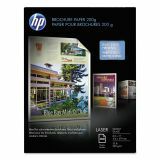 Designed for Hewlett-Packard Color LaserJet printers. Acid-free, lignin-free. 58 lb. 7.5 mil.